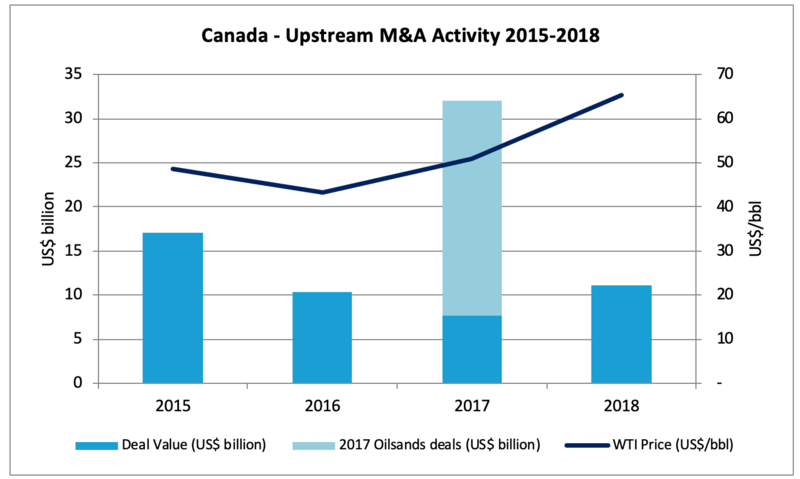 In another year where North American deals dominated upstream M&A activity, Evaluate Energy’s latest Global M&A review shows that Canada saw US$11.2 billion in new deals announced in 2018. The full M&A review can be downloaded at this link. This US$11.2 billion appears a major drop from the total value of deals in 2017 (US$32.0 billion) – this value, however, was skewed by a handful of major oilsands sector deals in the first quarter worth a combined US$24.3 billion. 2018 almost had a major oilsands deal of its own – that is, before Husky Energy Inc.’s attempted US$4.9 billion takeover of MEG Energy was terminated last week. Husky decided that it would not extend the offer that expired Wednesday without receiving the necessary two-thirds support. “Husky’s share price rose immediately after this announcement by 13 per cent, which arguably shows that Husky’s shareholders were not enamoured with a deal taking place in the current pricing environment,” said Eoin Coyne, Evaluate Energy’s senior M&A analyst and author of the Evaluate Energy 2018 review. Evaluate Energy’s M&A review of upstream deals in 2018 is available at this link. The report includes details on global deal-making trends, the largest upstream deals of the year in Canada and around the world, as well as an in-depth look at a huge year for deals in the United States.